I'm just returned from the Edward Hopper studio in S. Truro, MA on Cape Cod. We had a blast. Good weather and a smile from the Muse helped me do a ton of good new work. 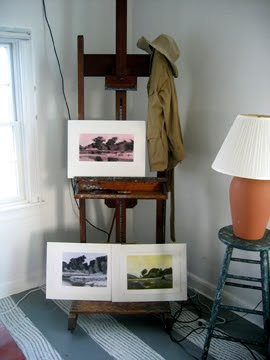 Above is Hopper's easel holding instead of his masterpieces three new vine charcoal and pastel drawings I did while there. His easel, by the way, is nothing special- it's the type still available today from art stores. Like everything else, Hopper worked with ordinary tools, materials and subjects, yet very often produced things that were magical. Above is my wife Alice standing next to the 10' tall north facing studio window in the studio's painting room. That and the high ceilings give the room a steady bright daylight all day long. It's frankly a beautiful space. Hopper placed his easel just to the right of the window when he worked, as that's the spot where glare from the late afternoon sun could most easily be avoided. 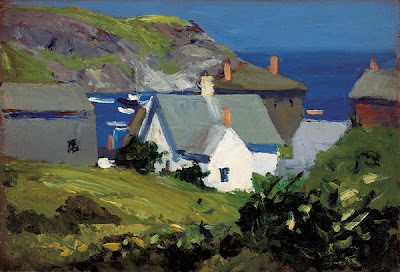 Above is Monhegan Houses, Maine painted early on in Hopper's career around 1916-9. Monhegan was popularized as a great place to paint among artists largely through Hopper's charismatic teacher Robert Henri. Hopper was one of many who made voyages out to the little Maine island. 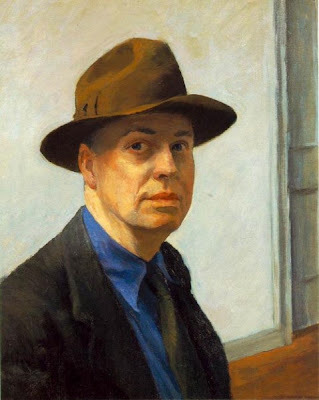 His fellow Henri student, Rockwell Kent, liked Monhegan even better than Hopper and chose to stay and build a formidable studio there later owned by Jamie Wyeth, but that's another story. Hopper did mostly small plein air oils while up there, and they rank among the very best paintings ever made of the island. This one's a view of the tiny village with Manana Island in the background. 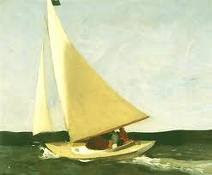 Nowadays lots of artists have painted similar views, though most lack Hopper's expressiveness. 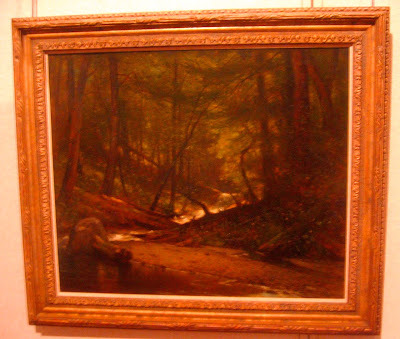 When your first impression of an artist comes from looking at reproductions in art books or images on a computer, you can get the sense the artist was flawless. Hints of the struggle the artist had with the piece can be hidden by the photograph. And you can come away with the sense the artist's feet don't really touch the ground. But as a veteran painter, I assure you they do. Completing a painting is a little like scaling a mountain. You get to the top by a circuitous route and you take a lot of steps. Later this Fall I'll be heading north to go and work in the old painting studio of perhaps the most prominent 20th century American realist artist, Edward Hopper. That's Hopper above in a self portrait done in his maturity. I've been very fortunate to have the opportunity to stay and paint in his studio thirteen times since 1983, due to the generosity of it's current owners. I love the portrait above. Hopper seems to gaze out at us with a thoughtfulness and understanding I find touching. In reality he was a complex personality, troubled by depression and some social anxiety that pushed him to live an almost reclusive life. But while that may be true, he was also a man of enormous talents and extreme generosity, devoting his life to a vision that has meant so much to so many. This is my studio this morning. 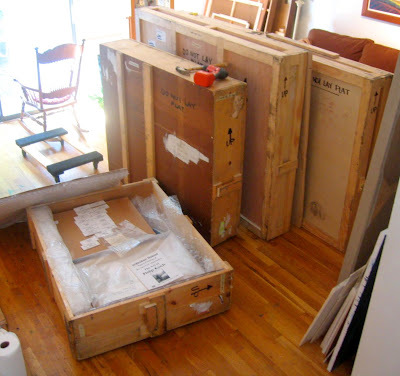 Late yesterday the four heavy wooden crates came home carrying my paintings from my national traveling exhibition Unbroken Thread: The Art of Philip Koch. These same crates carried the show out to Washington State to the Clylmer Museum of Art in Ellensburg early this year and then traveled to Indiana for the Midwest Museum of American Art's installment of the show this June. They'll be staying home until next summer when they'll take the show down to a beautiful non-collecting art museum, the Peninsula Fine Art Center in Newport News, Virginia. My wife Alice and I drove down to see the museum and talk with it's Curator, Michael Preble, last May. We liked what we found very much and are excited to show there next summer. Washington County Museum of Fine Arts is one of those places that when you visit for the first time you scratch your head and wonder "What's a museum with a collection like this doing here?" Rebecca Massie Lane, the Director of the Museum, asked me to join their Board of Advisors. As I've been a fan of the Museum for years and had an exhibit of my own paintings there back in 1995 I said sure. Was just out to Hagerstown, MD for one of the Board's meetings last Thursday and took time afterwards to enjoy the quiet of the galleries.